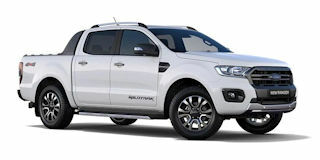 Download the latest Ford Ranger brochure and specifications document as well as get the latest pricing for this vehicle. The Ford Ranger streamlines life through its advanced connectivity function. It features SYNC®3 that enables a fully integrated voice-activation system that allows for instant connectivity to your devices, while your hands are on the wheel and eyes kept on the road. Connect to your contacts, either friends or family while you play and listen to your favourite playlist. Stay on track with the integrated satellite Navigation system that is equipped with a customisable 8” colour LCD capacitive Touchscreen: SYNC®3 is quicker and more responsive than ever. Note: Features differ per derivative. See specification sheets. Navigation standard on all XLT and Wildtrak derivatives commencing April 2017 production. All derivatives built prior to April 2017 production will not have Navigation.